Plaque is a sticky biofilm that forms on your teeth. It’s filled with damaging bacteria, won’t rinse away, and remains until you floss and brush. Once plaque stays on your teeth for 24 hours, it picks up minerals from your saliva and begins to harden into tartar, which even flossing and brushing can’t remove. Tartar irritates your gums, making them swell and bleed. Irritated gums begin to pull away from teeth, creating vertical spaces called pockets that let plaque linger below the gum line. These pockets are symptoms of periodontal disease. The bacteria that live in them damage the teeth and gums, and can cause a long list of other problems, including heart disease. 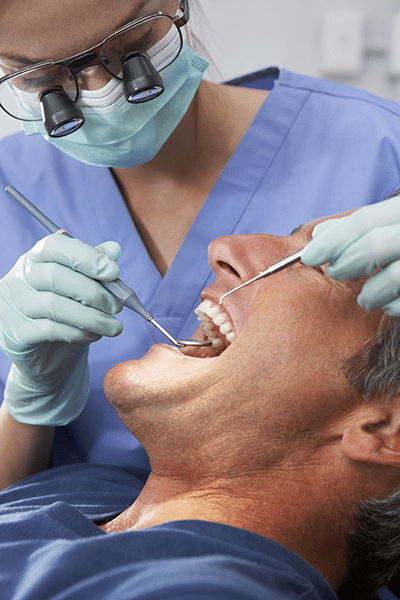 A regular professional dental cleaning removes plaque, tartar, and bacteria above the gum line. Along with twice-daily brushing and flossing at home, that’s about all that a healthy mouth requires. For people with periodontal disease, however, a regular dental cleaning isn’t enough to interrupt the cycle of bacterial infiltration that can lead to diseased teeth and tooth loss. The pockets that form in the gums become deeper, and more-damaging bacteria begin to grow in them. This process of infection leads to worsening periodontal disease, as bacteria damage the bone that holds the teeth in place. Periodontal scaling and root planing forms the first line of treatment against periodontal disease. This non-surgical procedure uses a combination of hand instruments and ultrasonic tools to remove plaque, tartar, and bacteria below the gum line. The procedure also smoothes out rough spots on the cementum, or outer layer, of tooth roots, eliminating convenient places for colonies of bacteria to attach. The bacteria loosened and removed by the procedure can move from the mouth into the bloodstream. This may cause problems for patients with heart or liver problems, or with weakened immune systems from disease or medication use. These patients must take antibiotics for a period of time before undergoing intensive dental treatment. For patients with deep gum pockets, a periodontist may insert small doses of antibiotics directly below the gum line during the procedure to help the tissue heal and reduce bacterial regrowth. In most cases, periodontal scaling and root planing begins with local anesthetics to numb a quadrant of the mouth—half the upper or lower jaw—and antiseptic rinses to diminish bacteria. It’s difficult to treat more than one fourth of the mouth a time because anesthesia makes it challenging to eat, swallow, and avoid biting the tongue or the inner surface of the cheek. Patients with periodontal disease that affects only part of the mouth may not need repeat visits for additional scaling and root planing procedures. Other patients may require further treatment in other quadrants of the mouth. After periodontal scaling and root planing, some patients experience discomfort in their gums, which typically disappears by the following morning. The periodontist may prescribe pain medication and recommend an over-the-counter toothpaste designed for temperature-sensitive teeth. To maintain oral cleanliness, the periodontist often prescribes a special antibacterial mouth rinse for short-term use, along with antibiotics. Warm salt rinses also can help speed the healing of gum tissue. On a follow-up visit, the periodontist checks for signs that the pockets in the gums have gotten smaller and the tissue forms a tighter seal around the teeth. To maintain oral health after periodontal scaling and root planing, it’s critical to floss and brush twice a day, using proper techniques to remove plaque without damaging teeth or gums.